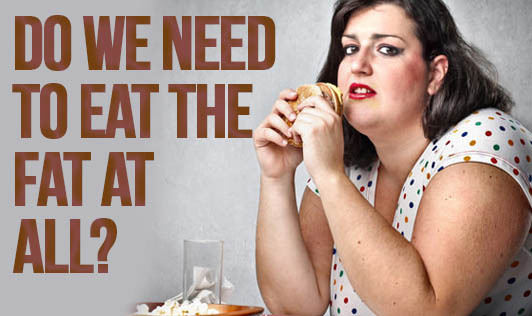 Do we need to eat the fat at all? Let us see how the fats are classified. Most simply, they are classified as saturated and unsaturated. Unsaturates are further divided into monounsaturated and polyunsaturated. Polyunsaturated also contain the essential fatty acids which are grouped in two families - Omega-6 and Omega-3. There is another kind of fat which is talked about a lot with regard to health - trans fat. Trans fatty acids are created in food processing and also naturally occur in beef, mutton and dairy products. • Fat provides a highly concentrated form of energy. One gram of fat gives you nine calories, which is more than twice provided by carbohydrates or protein. • Fat enables your body to transport, store and absorb the fat-soluble vitamins A, D, E and K. An absence of fat may mean a deficiency in these vitamins. Fat-soluble vitamins help to regulate blood pressure, heart rate, blood vessel constriction, blood clotting, and the nervous system. • Fat provides insulation and a protective cover for vital organs. In an average adult, as much as 4 kilo of fat is found around the liver, heart, kidneys and other organs. • Essential fatty acids from omega-3 and omega-6 fats cannot be made by your body, and therefore they must be supplied through your diet. Dull, lifeless hair and dry skin can be a sign that you may not be getting enough of these essential fatty acids. And of course, fat adds extra flavor, aroma, and texture to food, which is perhaps why we so often and very easily eat too much of it. Remember to limit your fat intake and to choose "good" fats whenever possible.